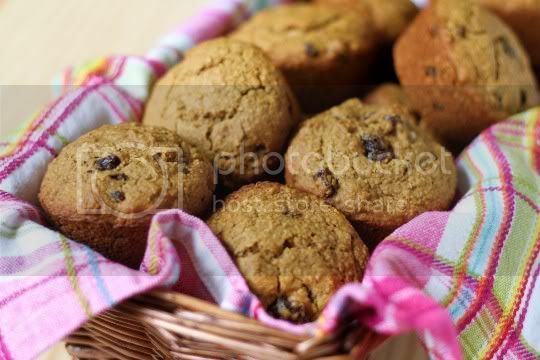 Bran muffins that contain no eggs, dairy, or loads of oil...how much healthier can you get? Well, try adding flaxseeds and whole-wheat flour, and only sweetening with molasses and maple syrup. If you like the hearty, earthy flavor of bran muffins, you'll definitely want to try these out. Yes, these are vegan muffins, but you probably couldn't tell. It's also pretty impressive at how easy they are to make. They don't really require any strange or complicated ingredients, and they come together just as any other muffin recipe does. Simply mix all the dry ingredients, then all the wet ingredients, and combine them together. Stir in the raisins (and nuts if you want, which are suggested in the original recipe), pour into muffin tins, and bake. That simple. Making the flaxseed mixture for the egg susbstitute is probably the most fun. It's really amazing how it comes together: after just a few minutes in the blender, it's goopy, slippery, slimy, and thick. Just like real eggs, perfect for binding! It smells a bit plant-ish (which does carryover to the finished muffins), but just think of all those omega-3 fatty acids you're getting...without having to eat fish! The muffins really do have a great texture, and you really can't tell from a texture standpoint that these are vegan. They're moist, dense, and chewy, and definitely best served still warm from the oven (don't overbake them!). Leftover muffins are a bit dry, but they do keep well frozen. Surprisingly, there isn't a ton of your typical "bran" flavor, but I assume that's because oat bran is used instead of wheat bran. But combined with the whole wheat flour, there's a greaty nutty, earty, healthy taste. 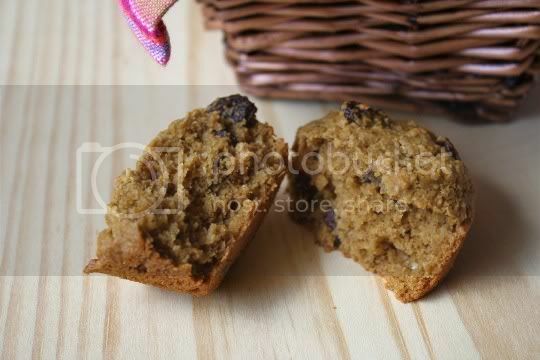 The muffins are mildly sweet, with a super rich molasses flavor, but most of the sweetness actually comes from the raisins...which is good because they are in high abundance. Although I did consciously omit the walnuts in the recipe, I plain ol' forgot to sprinkle the tops with sugar before baking. I'm sure this would have added some extra sweetness (especially with a nice crunchy, caramel-like turbinado), but it's up to your own individual tastes. Make again? Probably not. This was a good muffin recipe, but I'm not big on the bran thing. But I was impressed with the vegan baking techniques! Preheat oven to 375. Grease (or line with paper liners) 16 to 20 muffin tins. 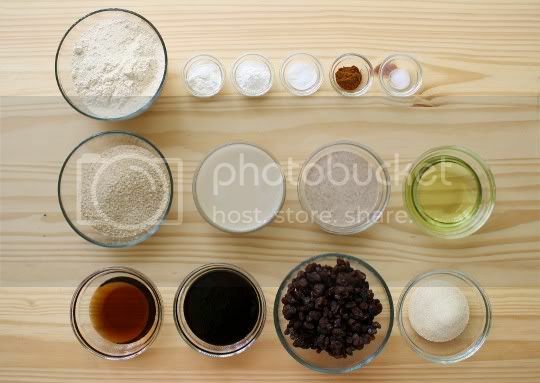 In a large bowl, sift flour, cornstarch, baking powder, baking soda, cinnamon, and salt. Blend well. Add oat bran, and combine well. In a separate large bowl, beat soy milk, flaxseed mixture, oil, maple syrup, and molasses for 1-2 minutes. Add raisins and mix until combined. Fold dry ingredients into wet ingredients until moistened. Fill muffin cups 3/4 full. Sprinkle with turbinado sugar, if desired. Bake 22-25 mins or until golden brown. Cool 5 minutes on wire rack, then remove and cool completely. Gasp! This looks really great! I might just have to make these! Bookmarking!!!! "1/2 cup flaxseed egg substitute (blend 1/2 cup ground flaxseeds and 1 1/2 cups water on high speed in blender until thick and frothy, set for 1 hour in fridge, will make a little more than 1/2 cup)"
There is no way that 1/2 cup of ground flaxseed and 1 1/2 cups of water only makes 1/2 cup of egg substitute. It surely must make something approximating 1 1/2 cups. Try it and see! The longer it blends, the thicker and goopier it gets. I'm not sure about the actual chemical reaction and such, but it definitely doesn't make anywhere close to 1 1/2 cups. Maybe 3/4 cup.